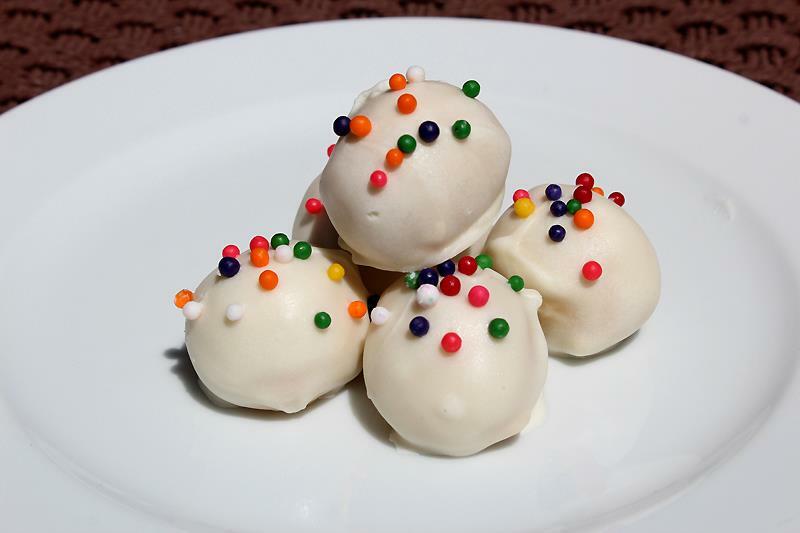 Happiness Project Recipe #7: Sprinkle Cake Batter Truffles! Mmmm. Cake. Who doesn’t like some really good cake? Especially when it’s bite-size! Before finding this recipe, I had never worked with truffles before so the very thought of creating an actual truffle seemed rather intimidating to me. Was I sadly naive? Yes. You want simple? You get simple! You want messy? You get messy! Best of all, you get a ridiculously fun, yummy dessert that’s a sure fire way to please just about every sweet tooth in the family! Guaranteed! Here it is, my friends! Once you’ve gathered all your ingredients, here’s a handy tip! Wear an apron. You’re going to get very, very messy. Case in point: I did NOT wear my apron & paid the price. My kitchen had splattered dipping chocolate dripping all over the place. My hair included. Beat together the butter and sugar with an electric mixer until combined. Add the flour, cake mix, salt & vanilla into the mixing bowl and mix thoroughly until well combined (you can easily mix this by hand if you don’t have a stand mixer). Add 3 Tablespoons of milk to create a dough-like consistency. Now the fun part! Mix in those jumbo rainbow sprinkles by hand. Once your sprinkles are generously incorporated, roll dough pieces into 1 inch balls and place on a parchment or wax lined cookie sheet (I swear by my Silpat, which you can buy at any Sur La Table location). Chill the dough balls in the refrigerator for 15-20 minutes to help firm them up. Remember how I just recommended wearing an apron? You’ll need to use it for this next step. While your dough balls are chilling, melt the white dipping chocolate in the microwave in 30-second intervals until melted. Stir between each 30-second interval. Using a large fork or spoon (whichever is easier to handle), dip dough balls in the melted dipping chocolate and shake off the excess chocolate by gently tapping the fork or spoon on the side of the bowl. Place the coated truffle back onto the cookie sheet and top with sprinkles. Quick tip: the melted dipping chocolate will solidify fairly quickly, so you’ll want to distribute the sprinkles with haste. Repeat this technique with the remaining balls, one at a time. Chill your cake batter truffles in the refrigerator until serving or the coated cake batter will start becoming a bit gooey. Unless, of course, you like gooey. Overall, this is one of the messiest but easiest dessert recipe I’ve had the pleasure of re-creating thus far. You will LOVE it! Trust me. « Happiness Project Recipe #2: Chocolate Chip Blondies!